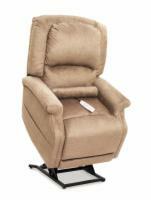 The PR-931M Space Saver lift recliner is a wall hugger liftchair. This means that the Space Saver can be placed only 5 inches from a wall, yet still fully recline. Unlike other wall hugger lift chairs, the Space Saver uses a three-position lift mechanism instead of a two-position one, allowing the user to recline further back. The Space Saver comes with overstuffed cushioning, a full chaise pad, and a removable back. Best Feature: The Space Saver's wall hugger ability makes it great in tight spaces. Our Recommendation: The Space Saver only comes with a 1-year warranty, but if you have a small apartment or need a lift chair in tight quarters, this lift chair is the perfect solution. 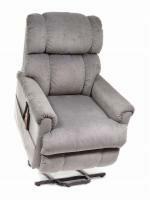 If you'd like additional information on the PR-931M, call our lift chair experts at 1 (800) 791-6814.